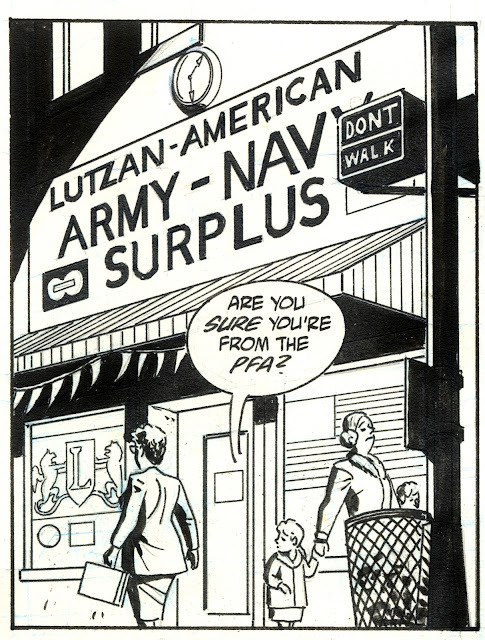 One of the reasons it took me 2 to 2 ½ days to pencil and ink a page on “The Mark In America” was that I designed and penciled the incidental signage, such as in panels one and two/three. I didn’t buy my first computer until 2000, so in 1993, I would (if the signage was shown at an angle) design it first on a separate piece of paper, draw a grid on it, draw the grid in perspective on the comic board, and distort the signage along the grid-in-perspective. All the letterer had to do was ink it. Now I could just use Photoshop’s type tool and distort it. It will look better to boot. In fact, if these pages ever get reprinted I will do exactly that. Panel 7 is rather odd; this is sort of thing that can result when the writer (in this case, Mike Barr) and artist (in this case, me) are working “Marvel Style” (the writer gives the artist a tight plot outline, writing the captions and word balloons based off the artist’s pencils) and aren’t communicating very well. 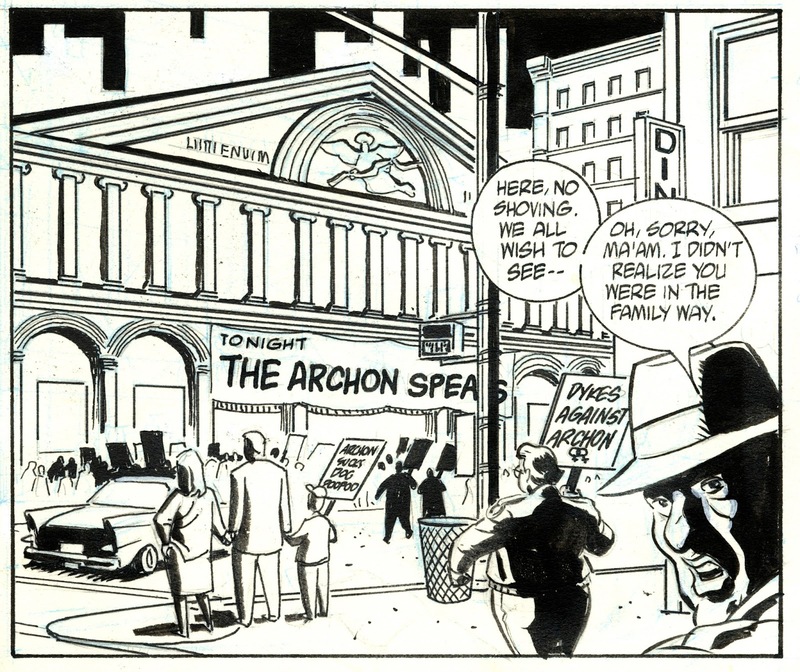 I drew the man’s head in the foreground merely as a design element; Mike Barr apparently got the idea to have the man speaking to the camera as though it were a POV shot for Helda, setting up her subsequent infiltration into the audience of The Archon’s speech. Not a bad idea, but if I’d known, I would have staged it more clearly, like foregrounding the man even more and putting another foreground figure on the left side of the frame, hopefully not obscuring the building facade in the back ground which was the whole point of the panel. This is page 20 for "The Mark" issue 2, volume 2, otherwise known as "The Mark In America", published by Dark Horse Comics in January 1994. 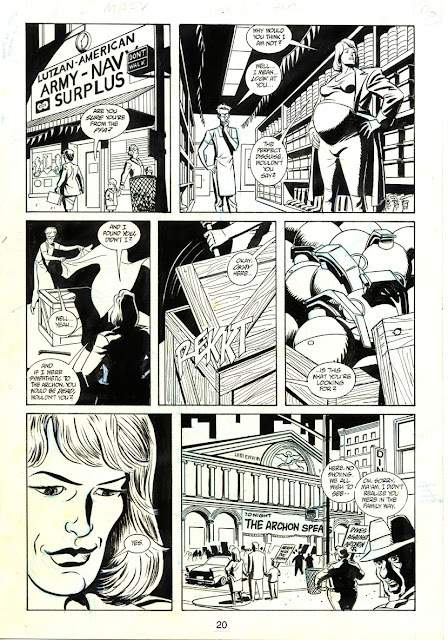 Written by Mike Barr, drawn by Brad Rader.